The project was created to improve student employability and social impact by developing a unique student media production endeavor. By creating specific synergy between media corporate and educational institutions new modalities of cooperation were established in order to allow students to gain more practical experience and to present themselves and their work to media corporate as potential future employers. Creating a new student broadcasting platform has introduce some changes in curricula and teaching methods. Also, it gave students a channel for expressing their ideas, greater influence the society and stronger international connections among students in the region. The Project was lead by the University of Arts in Belgrade in partnership with University of Novi Sad, College of Applied Sciences of Electrical Engineering and Computer Science in Belgrade, University of Banja Luka, University of Sarajevo, Aleksander Moisiu University of Durres, University of Tirana, Academy of Music Arts in Bratislava, University of Ljubljana, National Academy for Theatre & Film Arts “Krustyo Sarafov”, Serbian Broadcasting Corporation, Radio Television of Vojvodina, Radio Television of Republic of Srpska, A1 Report Television, Radio Television Bosnia and Herzegovina, and Student Association of Serbia. Project RODOS addressed harmonization of doctoral studies with the needs of academia, industry and society. The wider objective of this project was to restructure doctoral studies in Serbia in line with the Bologna Process and Salzburg Principles, emphasizing quality of research and integrative processes which involve universities, research institutes and industry, and result in the establishment of Doctoral Schools. Conference of Universities of Serbia, University of Belgrade, University of Novi Sad, University of Arts in Belgrade, University of Nis, University of Kragujevac, State University of Novi Pazar, Singidunum University, Serbian Academy of Science and Art, National Council for Higher Education, Ministry of Education, Association of PhD students and young researchers of Serbia, University of Ghent, Instituto Superior Técnico, Technical University of Crete, University of Natural Resources and Life Sciences, Vienna, Electric Power Industry of Serbia and Serbian Chamber of Commerce. The SCENTEC project was aimed towards establishing interdisciplinary training courses which would be an amalgamation of knowledge from the field of arts, and technology, in a way that will enable the respective participants to acquire competencies which would be highly applicable in professional life. The implementation of courses has brought improvement to creative, technical and safety standards of work in theatrical and public venues in partner countries, in accordance with good practices in EU countries. Equal access to higher education provides advantage in access to labour market and represents a major tool for eradicating poverty and social exclusion. With this project we are aiming to increase chances of youth in Serbia to enter and remain in higher education (HE), especially Roma, persons with disabilities, rural population, young people from lower education families and other underrepresented groups. This project in a field of music education was lead by the University of Arts Belgrade and consolidated efforts of experts from 6 EU countries – Austria, Czech Republic, Lithuania, Netherlands, Slovenia and Sweden – and 3 Western Balkan countries – Serbia, Bosnia and Kosovo. 18 institutions from Higher Education (HE), enterprises, science, association of universities, governmental, student and professional organizations will be involved in the project. The wider objective of the project is to contribute the reorganization of musical education in the WB region in line with the current European trends. 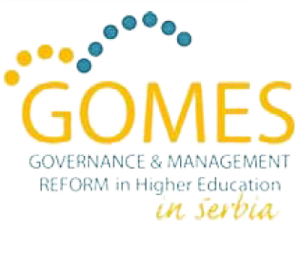 The Project GOMES supports the structural reform of higher education in Serbia and the strategic framework development adopted at the national level by the National Council of Higher Education (NCHE), Ministry of Education (MoE) and the Conference of Serbian Universities (CSU). The IQA and enhancement system at Serbian universities is built with the observance of the autonomy and specific character of the university units, on the basis of their positive experiences in the QA. Some of the outcomes are IQA framework for Serbian universities adopted at the national level and formation of Quality Assurance Centers at each university, with full engagement of students, teachers and administrative staff. Establishing Central University Services is a structural measures project aimed at upgrading strategic and reform capacities of administrative staff working at the university central administration, and at the university’s organizational units (constituent faculties), in order to prepare the staff for functional integration of administration and services. Besides administrative capacity building in preparation for future integrative function of the University, this project focuses on establishment of an embryo of central university services that ought to integrate and coordinate the present parallel services that exist at the faculties. In the final stage of the project the established central university service ought to demonstrate pilot enrollment of students to all study programs offered by the faculties of the University of Arts in Belgrade. The Project aims at enhancing the capacity for institutional development enabling students participation in and influence on higher education governance throw the Student parliament, in accordance with Bologna process and new Law. HE systems of West Balkan countries (Serbia, Montenegro, BiH, FYROM, ALB and Kosovo) are based on common historical educational background and common legislation. WB countries started a reform of HE by changing their legislation and implementing the main Bologna principles in their HE systems. This project objective is to contribute to establishing cooperation links with National Teams of Bologna Promoters from all WB countries and similar bodies in EU member states and assist the ongoing process of Higher Education reforms in line with the Bologna Process. This program helped in building university strategies for the implementation of Bologna Process in Serbia, reinforcing the Bologna Process implementation, establishing University and Faculty commissions for university and faculty strategies for BP implementation, establishing a University network among Serbian Universities and promotion of BP principles and long-term activities regarding Bologna. The outcomes of the project are: Bologna process implementation, national reform strategy development for Serbian universities, definition of level descriptors (level of qualifications), definition of learning outcomes for European HE common space, definition of Diploma Supplement formats, working documentation for the National Team, training and promotion documentation, proceedings of the final Conference. The aim of the project is to restructure the postgraduate programmes in art and media studies at the University of Arts, Belgrade, and to implement a long distance learning system. The aim was modernization of university libraries: internet access and network, established standardized software and cooperative database, reachable electronic information resources through web sites for alI users from universities in Serbia. The aim of the project is to create a methodologically and technologically upgraded framework for restructuring Art history curriculum at B.A. and M.A. degree level.